What do you need to create a good Romeo and Juliet? To do any Shakespeare can be a challenge, because of the anticipated struggle with the language, or with twisting and unfamiliar plots. Sometimes, however, a challenge exists because of the opposite reasons: the language and plot are SO familiar, they've become embedded into our cultural consciousness. Such is the case with Romeo and Juliet, where the struggle can come from audiences who think they already know all they need to know about the play. The blasé, self-styled authority is a peculiar challenge all its own, whether they come convinced that Romeo and Juliet is a play about overwrought teenagers who kill themselves for no good reason, or they know every word so intimately they'll be dissatisfied if an actor chooses a "wrong" inflection for a word or phrase. Both can be deadly, so how best to avoid them? The short version is, Be smart. Choose the story you want to tell about the star-crossed lovers of Verona, and put in the work to MAKE it work. 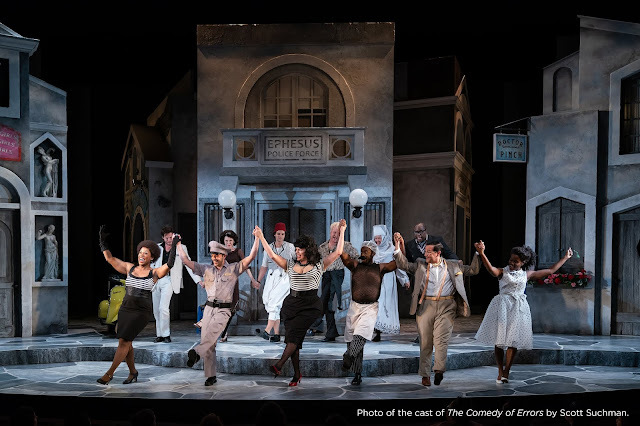 Alan Paul, Associate Artistic Director of the Shakespeare Theatre Company, has here the job of engaging this most basic, most difficult challenge, and doing so in his first foray directing Shakespeare for his company. The great work begins long before the curtain rises, and its a pleasure to say that Paul did indeed put in the time and labor with strong results. It's all too easy to say that Romeo and Juliet are foolish teens who make colossally poor choices, and claim that their fabled great love story is nothing of the kind. The problem with that approach is that it doesn't make for good theatre. Instead, Paul gives us a production that believes in the love story at its core, while not ignoring the danger of the violence and decay imbued in the world that surrounds it. Ayana Workman is undoubtedly the soul of this Romeo and Juliet. Her youth and vitality bring Juliet vividly to life, from the moment she enters, the effect is instantaneous: you cannot cynically brush aside this young woman's story because she's "only" a teenager or because you know the story too well. That's what makes you twitch in your seat--Workman's Juliet is SO young, so alive, so pulsing with intelligence, bravery, and determination, and before the night is through, Juliet will have died. The story feels immediate, terrible, and terribly real. 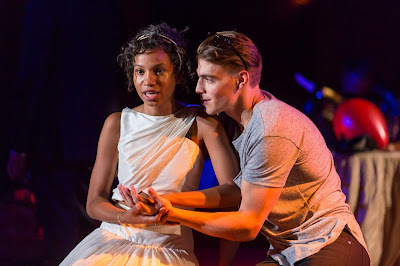 Andrew Veenstra brings the production a Romeo who is as captivated and charmed by her as the audience is, trying hard to distance himself from his first entrance from a fight he wants no part in. production of Romeo & Juliet, directed by Alan Paul. Photo by Scott Suchman. I was also terribly pleased with the return of Jeffrey Carlson to STC, last seen in the title role in Hamlet in 2007 and 2008, a performance which I may or may not have seen six times (spoiler, gentle reader: I did). What I loved best about Carlson's alternatively brooding and manic Hamlet was the prince's ferociously fast mind that moved at a pace ten times quicker than anyone else's in Denmark (with the lone exception of a gravedigger). Carlson's Mercutio shares some of that same energy, with a mind moving at a speed his stillness might belie at first glance, and his Queen Mab speech is the most appealing I've seen. Audiences always want more Mercutio than we get, but I felt it acutely in Paul's production. The Capulets, Montagues, and their assorted hangers-on inhabit a dark red, two-level space designed by Dane Laffrey, conjuring something like the decaying, rotting glamor of a hotel or club that used to be the pinnacle of decadence. The glamour of the surroundings is fading and oppressive, like something you might register dimly through the fog as your week-long bender reels to an end. Here, the deep red haze is one that comes from marinating in violent and bloody feuds that no one is able to escape, whatever side they take or try to deny. I confess, I'm not entirely sure why the second level was there, as it wasn't used to particular effect, except that someone probably thought a balcony was de rigueur for any Romeo and Juliet. Kaye Voyce's costumes were a miss for me; as soon as my companion likened Romeo's look to Justin Bieber, I was done for. Mercutio's party suit, however, can stay. directed by Alan Paul. Photo by Scott Suchman. 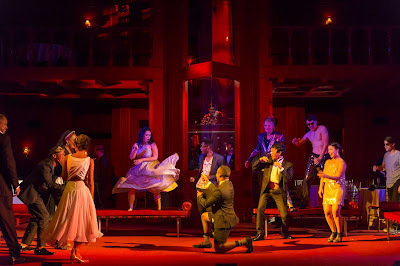 What I return to when I consider this Romeo and Juliet is not the imperfections, but the way in which, more so than in any other Romeo and Juliet I've seen in recent years, I found myself rooting for these crazy kids: couldn't they, just this once, make it? Could we at least pull a West Side Story here? No? Ah, well. I might have some quibbles, but Alan Paul's production reminded me of so many reasons why Romeo and Juliet is a genuinely good play. With something so familiar, we can sometimes forget that simple truth, but here, it's hard to deny. I imagine that this production may not be popular with everyone, but for my taste, I can see the thought and care that went into creating its heart. I can appreciate the actors' text work that shapes the verse, and I can hope that this production will grab some students at the school matinee and make them feel the tug on their hearts that Shakespeare can also be for them.